CBA Tanzania is a member of the Commercial Bank of Africa Group, headquartered in Nairobi, with subsidiaries in Kenya, Tanzania, and Uganda. CBA Tanzania offers personal, corporate and investment banking solutions. 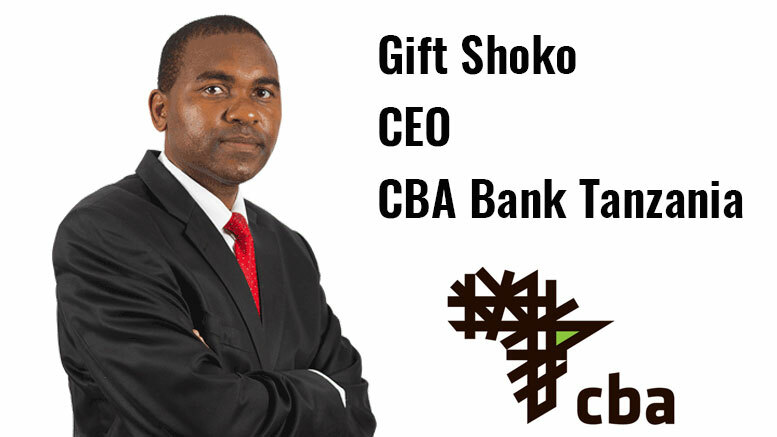 Shoko discusses the Tanzanian banking sector and CBA’s future plans. TanzaniaInvest (TI): The Tanzanian banking system is currently experiencing a credit crunch. The transfer of parastatals’ accounts from commercial banks to the Bank of Tanzania (BOT) that took place this year seems to be among the reasons. What is your take on that? Could consolidation take place? Gift Shoko (GS): Centralizing treasury accounts for control purposes has been done in other countries before. Tanzania is indeed currently experiencing a period of tight liquidity; however, this is not enough to judge whether consolidation should take place. Whether expansion or consolidation should occur depends on certain key factors such as the target market and the potential of that market. The case for consolidation depends to a large extent on the time it will take to stabilize the liquidity situation in the market and the continuity and sustainability of the regulatory interventions under the Open Market Operations (OMO). The current liquidity stress also raises the question of whether Tanzania is overbanked which is difficult to assess but the country has great potential and a lot of unexplored opportunities in agriculture, mining, industry, tourism etc. Overbanking is a function of the economy’s capacity to convert its available resources into liquidity. However, I believe that the liquidity crunch is temporary because banks in Tanzania are actually highly segmented with quite different target markets. There are banks focused on particular communities, others on certain segments of the economy, and commercial banks, which are not that many. TI: The Non-Performing Loans (NPLs) ratio has risen in recent years, with 22 banks having NPL ratios above the indicative ceiling of 5% set by the BOT. What is the current situation at CBA? GS: In general, the rate of NPLs depends on each bank’s approach and the exposure that it has. NPL is a general albatross of the banking sector and this is linked to Tanzania’s economic performance. It is the phase that the industry is going through. All banks including CBA Tanzania have been affected but what differs is the approach and management of the situation. The causes for these high NPL rates are various but the main ones are general liquidity tightness in the economy and slow circulation of money. At CBA Tanzania we have taken a proactive approach in engagement with our clients. Going forward we have put measures and controls that ensure prevention as a better approach to cure. TI: CBA offers a wide range of financial services, including personal, corporate, and investment solutions. Considering the performances so far in 2016, which segment has proven the most profitable for you? GS: In 2016, we witnessed the fastest growth in the low end banking segment and the Small and Medium Enterprises (SMEs), in particular through our product MPAWA [a technology-based product, which enables people to make savings and access loans through the mobile platform]. Our corporate banking segment has also experienced significant growth, particularly in the construction industry. CBA is one of the biggest banks supporting construction in Tanzania, in terms of guarantees and asset financing. TI: The current Government has made the decision to move its headquarters to Dodoma. How do you think this would impact real estate in Dar es Salaam? GS: I do not foresee significant changes. I expect some short-term changes as the government relocates to Dodoma; however, I think that Dar es Salaam will remain the commercial hub of Tanzania due to its strategic location. Taking Nigeria as an example, Lagos remains the country’s commercial centre and land prices are quite high despite the government’s relocation to Abuja. TI: Tanzania is aggressively pursuing its financial inclusion strategy and mobile technology is playing a key role in that. How is fintech impacting CBA’s strategy? GS: Our focus is on the use of technology, as we believe that the customer of the future wants to move with their bank in their own hands, doing the transactions on-the-go. We started with the mass market and came up with a technology-based product, MPAWA. Through MPAWA, our customers can access loans using the mobile platform; and we are now coming up with products for the other segments as well. First, we have started with an enhanced form of internet banking that will be launched soon. Two months ago we have also launched our Private Banking targeted at decision makers for whom time is critical and technology will be key for this segment. Also, there will be a number of other technology-driven products that are coming forth for each segment of the market. We aspire all of our products to be accessible using digital platforms but we will remain a bank in essence with a focus on providing loans and creating technology enhanced products. In addition, our parent company has a big bancassurance division, and we have started to implement the same model as well. TI: How do you keep competitive while using technology? GS: In terms of competitiveness, the available customer databases are critical. But these databases do not necessarily have to come from the mobile companies. For example, municipalities have at their disposal huge databases. The question is how can we convert those prospects into clients and derive mutual value with partners. TI: Tanzania is on the path of an industrial revolution. In which segments of the Tanzanian economy do you see the best opportunities for CBA’s growth? GS: We see huge opportunities in manufacturing as the government has a strong focus on value addition and we believe that we will also derive a lot of value from that process that will be carried out. We are also planning to enter specific segments of agriculture, such as fisheries, which is highly untapped and offers a lot of potential. In this area we are targeting companies focussing on value addition. We also consider increasing our presence in the tourism sector as it is also full of potential. TI: What are CBA’s overall ambitions and development strategy for the coming years? GS: In the next couple of years, I see us identifying ourselves with technology, for which we have planned vast investments engaging technology partners. CBA is a technology-driven bank, and it will remain focused on that. We anticipate some external constraints and challenges, including changes across the board. Nonetheless, I believe that in the next 2–3 years there will be a solid path, and the government would have created a predictable and dependable economic model for Tanzania and for us to thrive.